1. STOP THE POLICIES AND PRACTICES THAT DON’T WORK. Aerial spraying of toxic or organic pesticides doesn’t work. It is a waste of time and money. Plus, the toxic products are harmful to beneficial insects, wildlife, fish, pets and humans. 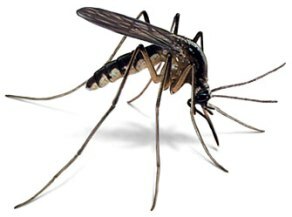 Aerial spraying kills a small percentage of the adult mosquitoes that might be flying when spraying is done, but it misses most of the adult insects, has no residual power and is completely ineffective on all of the eggs and larvae. Aerial spraying completely misses drain lines, storm sewers, old tires, moist mulch pockets, backs of leaves and all other protected water holding locations. The toxic synthetic pyrethroids that are used in aerial spraying would not control the larvae even if they hit these wet pockets. What will work is a serious program of clean up and elimination of mosquito larvae that should be used by homeowners, businesses and government entities on a year round basis. Here’s the rest of the program. 2. KEEP MONITORING: A preemptive program is needed. Waiting until traps are showing positive tests and people are getting sick is not the proper approach. A quality monitoring and mosquito/bird testing program should continue to provide the necessary data but getting the following steps underway immediately is the answer. 3. IMPROVE IRRIGATION: Residential and business landscape watering should be drastically reduced. Controllers should set on “manual” rather than “automatic “so the systems only run when the button is pushed. The policy of allowing automatic irrigation systems to run daily for short periods of time should be prohibited by all cities. Native plants and organic techniques and products should be encouraged because they will typically reduce watering requirements by about 50%. That savings happens because healthy soils hold moisture at appropriate levels for much longer periods of time. 4. CLEAN UP TRASH: Intensive trash cleanup is critical. This includes the pickup and disposal of plastic bags, cups, cans, bottles, lids, and other small trash items. Automobile junkyards are a particularly serious problem. Old tires are specifically a major problem. 5. DRAIN STANDING WATER: Empty all containers, pools, ponds, swamp areas and other bodies of water that contain stagnant water where mosquitoes breed. West Nile (Culex) mosquitoes only breed in stagnant, stinky water. 6. KILL THE LARVAE: For control of the Culex and other nuisance mosquitoes, treat entire sites with Bti (Bacillus thuringiensis ‘Israelensis’). Establishing this bacillus on entire properties will kill mosquito larvae and repel the adults from laying eggs. Bti kills mosquitoes, black fly and fungus gnats, but it is completely non-toxic to beneficial insects and vertebrates of all kinds. It’s also good to treat all water holding containers and natural areas that can't be drained with Bti. This step is particularly important for storm sewers, drain lines and other underground and protected areas. Abandoned houses and swimming pools should be high profile targets. Liquid and solid forms of this totally non-toxic material are now available and can be applied with most conventional spray or broadcast equipment. EPA registered products include Aquabac and Summit. As an important part of this program, Bti products should be encouraged by as many groups as possible to help the governmental agencies and the efficacy of the program - i.e. schools, churches, scout groups and various environmental organizations. Gambusia is a tiny mosquito eating fish that can be grown very easily as the City of Fort Worth and other cities are currently doing. Gambusia should also be made available with proper release instructions and distributed to water features, ponds and creeks across the problem areas. Bti and Gambusia can be used together. 7. SPRAY ADULTICIDES AS A LAST RESORT: In "hot spots" where West Nile mosquitoes have been identified, essential oil products can be pin-point sprayed to kill adults and larvae in water. One of the commercially available EPA registered products is Essentria. This is an acceptable organic product but should only be used for spot spraying in most cases because it will kill beneficial insects. This program is endorsed by the Texas Organic Research Center (TORC).